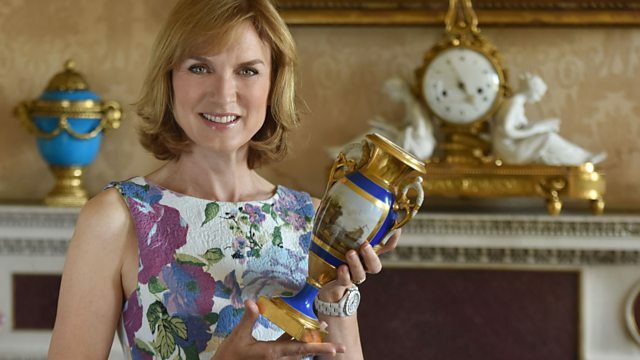 Fiona Bruce presents from the grounds of BBC Caversham near Reading. Items featured include a communion book once owned by Wilfred Owen and a vintage Aston Martin. Browse content similar to Caversham 2. Check below for episodes and series from the same categories and more! back as far as its founding in 1922. So, we're on home turf for this week's Antiques Roadshow. after the existing one was destroyed by a fire. owned the mansion, but he didn't get round to insuring it. and it was one of the first houses in England to be built in this way. and soon our usual tables and chairs will be put up there. He's widely regarded as England's greatest landscape architect. and keeping deer at bay while providing a seamless landscape. This refined setting has attracted some important visitors. while he was on a tour of English gardens. separated by a sunk fence and well-disposed with clumps of trees. this magnificent Cedar of Lebanon tree today. for our team on the Antiques Roadshow. It's a really good-looking table, but why the exercise books? through the efforts of my grandmother. to prove that it was actually a piece of Chippendale. in trying to prove that they were Chippendale. It's that magic word in furniture, isn't it? -a piece of Chippendale furniture. -the correct value for this piece of furniture? "how can you say this is... Where's the bill of sale?" -and I see, they wanted provenance, they wanted proof. And she said, "I'm jolly well going to give it to you." In the form of these books. And that's what she tried to do. that it was in fact by Chippendale. were referring to this directory and working in his style. it really is a weighty piece of furniture, isn't it? It's quite surprising when you try to lift it, just how much it weighs. It is great quality mahogany. so it was made at some point in the reign of George II, around 1740. Maybe slightly before that date. and the way that they're reflected in the frieze. in this sort of mid-18th-century period. So, Chippendale or not, it is brilliant quality. In fact, my instinct is that it is NOT Chippendale. -because she was obviously a very determined lady. I think it was almost certainly made in Ireland. would have been, even in that sort of period. Now, I hear that you're a great fan of the Antiques Roadshow. who were you driving with? -Who were you driving with? Now, what happened in the car as you were driving here? Made us play the theme and sing to it. You made them sing the theme? -Yeah, yeah, we did, yeah. and why you collect and what it means to you. loved sparkly things and pretty things. and I like clean lines and I like fancy stuff. and I said to him, "I'm after Art Deco,"
and then I saw this and I was like, yes! You were buying your own engagement ring? -I didn't trust him at all. So, that's ten years ago. -and where did you buy this? -Very typical '60s with this bark finish. and put into a later mount which they did a lot of that in the '60s. just made me go, "Oh, I love it," was this ring here. Now, this is such a bold ring for anybody to buy. um, sort of discreet in comparison. So, how... Where did you buy this and how did you buy this one? and I was, I don't know, looking to treat myself. And I saw it and I just, I kind of had to have it. It is just the detail. It's a 1940s, quintessentially of that period. And this is just a wonderful amethyst. This very rich, velvety purple. and it's 18 carat white gold with synthetic rubies. With those wonderful diamonds, sort of cushion shaped diamonds. you're looking in the region of about £1,500 for that one. you would be looking in the region of about £900 for that one. I would say that would go for at least £2,500. Now you will all definitely be singing on the way back, won't you? -Well, thank you so much, for bringing it in. so it dates from the same time as the house here at Caversham. in a house like this, learning how to entertain in style. Do you have a memory of it being played with? No, not that all. Not at all. who was my great aunt, who never married. and I was told I could have it, but I would get what was in it as well. And this is what was in it. -Oh, so this came free with a cabinet, then? cos it's really everything's there, it's so complete, isn't it? for serving the different courses of dinner. and even the little ladle there which would go inside. -on to the right sizes of plates. So you've got dinner plates there, those will be soup plates. and lots and lots of platters for serving wonderful food. What fun one can have with it. In there. And so little, different landscape views. They all look like different views. -as to where they are. -Right, so let's have a look. on the printed mark, there. -So that's a view of Tewkesbury church. as you played with the service. who made it? And there's the stamped mark which is Minton. -And little letter BB means "best body". -That was their trade name for this earthenware. in some way, and played with. grown-ups would have had in the same houses. but I think it's actually rather attractive. So, surviving in remarkable unbroken condition. So, quite, I suppose, a lucky find inside your cabinet. -Because I suppose it's going to be worth £700 or £800. It's a lot more than I thought. Wow, that's some colour, isn't it? down to uranium in the glass. and under ultraviolet light, it does change colour suddenly. to put the ultraviolet light on. people of a certain persuasion. They tend to all be technical. You be had to be, that or a chemist. It's true. Uranium oxide is used as the colouring agent. This little...what is it, a dish, I suppose, dates from 1891.
dates it to George Davidson & Co of Gateshead 1891. You had blue Pearline and yellow Pearline. So, are you going to show us how radioactive it is? a fairly basic Geiger counter. And that's what happens when you hold it up to the piece. I'm getting messages. Hold on. So this is uranium glass, which is the generic name for this type. It's not harmful to health? If you've just got it under a display case, I don't think it is. and you breathe in the dust from the breakage. I've got a collection of getting on for ten pieces now. I've paid between about £10-40 for them. That's one of the better ones. That was about... I think about £35, I paid for that one. It's worth £35, exactly what you paid for it. in terms of how nice it is to have it on the shelf and look at it. You brought your little battered case to the table and opened it up. pieces of scrimshaw kept coming out. usually depicting places they'd been and ships they were on. who was a merchant seaman in the 19th century. He made these when he was at sea. and you have photographs of the family. £4,500-6,000 in a maritime sale, easily. And I can't believe you've brought these here to me today! Well, this is a very, very lucky young lady in here. -Well, her name is Winnie. And she was given to a sort of aunt of my mother's. ..when she was a little girl. And then my mother had her when SHE was a little girl. -And now I've got her. Well, she's a lovely little French doll. as with this English bed. And the trunk bought from Cramer and Son in Regent Street, London. Now, what we don't understand now is just how rare this was. -A doll's bed like this was very expensive. And a trunk full of clothes, amazing! -And is this the little girl? Yes. That is the little girl who was given the doll. Her name was Isabel Salt. And she did come from quite a grand family. Her father was Sir Titus Salt of Saltaire. and I believe she was actually wearing fancy dress in that picture. ..so, possibly that was some event like that. -Yeah, I think it was. -And Winnie has seen all of this. I hope she wore her ball gown at the time. I think I'm going to lay her down before she gets her ball dress on. It is very rare to find such a beautiful array of clothes. -You must have all looked after these very, very well. Well, she's always been terribly special. it was a great thrill to go and see Winnie. you know, I had to go and see Winnie. This is an amazing bed. This is one of the best beds I've seen for a doll of this period. And you can tell that Winnie has been greatly loved. ..they would easily make £800-£1,200. Really? Well, they won't be. who found it as a heap of rust. this heap of rust, he thought, "There's something in there." and he managed to unearth this. Wow. Well, I hope he's cleaned it since then. that we've never seen before. What it is, very simply, is it's a folding key. I think it's probably going to be 16th or 17th-century. for something that probably travelled. So maybe a travelling chest or something of that nature. sitting full of treasures, they're waiting for this key to be found. -And you could reunite the two. you're particularly interested in these. and has not been passed down through the generations. and I have been collecting their silver ever since. I have four granddaughters who will use these on their wedding day. And walk down the aisle with them with flowers in. at the head of the wedding breakfast. from one, two, three, four, five generations of your family. And you've presumably bought these not too long ago? Over the course of the last eight or nine years. you had accepted his gift. so they could be shown off. and then slumped again in their collectability, shall we say. which was a little longer ago than that. They are all, nonetheless, quite valuable things. These two are, as you probably know, a pair. This one is absolutely gorgeous with its openwork pierced edge. It's just a little bit extra. It's just a little bit uncommon. And therefore probably worth a little bit more than the rest. These are 1870s and this one is 1864, as you know. Now, you've bought them recently. So I'll tell you what I think they're worth now. -But then they're presents for very special relatives. I'm going to say that if we said that one was worth 850. These two about 750 each. And this one about 650. That's exactly what I didn't want to hear you say! But still, they're going to very good homes. -So it shouldn't really matter. I've always fancied an Aston Martin. And as for a 1934 Aston Martin, it doesn't get much better than this. This is your car, you lucky thing. It is, yes. It is indeed. Now, it was used in the RAF, I gather? who we know owned the car. One was a Group Captain, the other was a Sergeant. -And this is during the Second World War? -During the Second World War. and it stayed in the RAF right through to about 1948.
climbs into an Aston Martin, roars off the runway. the car is sitting there outside the Nissen hut. And somebody shouts, "Scramble, scramble!" and drive out to the Spitfire and off they go. -And you think, yes, that must be wonderful. and you go off to the pub and you have your pint. And it becomes part of the team then. The RAF team, in a sense. -Well, it is. It is. And now you're driving it round the country lanes. Are you feeling glamorous and romantic and dashing? Oh, very much so. When I don't feel too tired. It's a heavy car to drive. -Because you've got this massive steering wheel. Because that's the only way you can get the car round a corner. because you have to, what they call, double declutch. And you have to remember that you have got the centre accelerator. and by the time you've done all that, you're exhausted. So you feel worn out at the end of it. -It's a gorgeous, gorgeous thing, I have to say. A Royal Air Force observer's flying logbook. This was my father John Mitchell's logbook. And he died recently aged 97. He was in the war. To begin with, he did a bomber tour. And then he went to Canada for specialist navigation training. so became an astro navigation expert. Actually he flew the King at one point. and got some of the VIPs to sign them. from World War II, as far as I can tell. And I think most people will know their names. -And of 21 Army Group who landed in Normandy. And then underneath it, Louis Mountbatten. -Again, another very well-known person. He went to the Yalta Conference. ..we can actually see that flight here on 3rd February, 1945. Your dad saying, here he is, duty as navigator. And as we've said he was the master navigator. In Malta. To Saki which is in the Crimea. Which is the closest airfield to Yalta itself. -Do you have any more of these? Yes, I've got a number of other notes signed by various people. for the logbook and your unique notes. -I've never seen anything like this. So thank you very much for bringing them along. of little people here, nodding away. And they just make me smile. But tell me, how did you end up with a collection like this? Well, I go on holiday to Mevagissey in Cornwall every year. because I thought they were so quirky. and then every year we've been down there, we've been looking for them. And this is the little collection I've managed to accumulate. So, over how many years has this taken you to put these together? -when we've been down there. -So they're getting a bit hard to find? I think they are, yes. Well, they are the most wonderful creation of a fantastic mind. And they are the work of an artist potter called Bernard Moss. but ended up settling down in Mevagissey in around 1949.
making things move, making things bounce. They said, "No, thank you. Not for us." "What's the matter? What's the problem?" He explained, got the little nodding figure out of his bag. "that Mr Worthington says we require one dozen of them. "Thank you." He was the director of the store. And what came out of that was this lovely relationship. are these at the front. -Which, as you can see, all have on them, Heal's for fabrics. that would be given to their best customers. What were you paying for them? The first one I paid £20 for. And the most I've paid for on the others is about 70. Well, I have to tell you, that's a good buy. is £200 now. A double, £250. And one like this with the chick, you're looking in excess of £400. you've got somewhere in the region of £1,500-£2,000 worth of figures. -Well, these have made me smile. Take them home and continue to smile. They're just fun. have one last bounce over the planet? What a fantastic brass dog collar. Can you imagine the size of the dog that is came off? -Probably a mastiff or something like that. "Mr G A F Bush is the master I own. "I know nothing of you, and so let me alone. "Best I foolishly fancy your hand as my bone." -maybe early 19th century brass dog collar. a little handmade lock with it, as well. And it fully works, as well. With its key. Excellent. It's fabulous. Where did you get it? Is it something you've bought? It was. It was at an auction room and I paid the grand sum of £50. Well, you did fantastically well. Personally, I think it's probably worth 300-400. -Thank you so much for bringing it. and I've never seen this particular model. I've not seen it illustrated anywhere either. It belonged to my aunt, who had a guesthouse in Jersey. who lived on the island of Jersey about 45 years ago. And you inherited it? And do you like it? And how do you make it stand? It's not happy, is it? It's not very happy at all. You go round it very gently. -I don't even want to try it. I would have known who this was by. one of the best, called Miya-o. And it's spelt M-I-Y-A, hyphen O. And people who don't know read it as "meow." He was working in Tokyo in the 1880s. And did some absolutely splendid figures. for people who were working in paddy fields. Hence the stilts, so he didn't get his feet wet. Or didn't get his clothes wet. Yeah. At least you're not saying, oh, he was a stilt walker. Was just sort of entertaining people. I think he's an absolutely fantastic figure. I mean, just look at the quality of that hair engraving. So, how much are we going to put on here? I think he would probably be 1,800-2,500. Yes. Very nice, thank you very much. Well, this is one very attractive lady. And I believe your mother shared my opinion. She did. It belonged to a friend of hers. But every time she visited, she absolutely loved this picture. And eventually her friend agreed to sell it to her. but did your mother tell you how much she paid for her? And this was some years ago? Yes, I think probably in the '50s. -So, a lot of money then. A lot of money in the 1950s. Was she a big art buyer, your mama? she never had anything else in our house that was any value at all. But this, she just fell in love with. Well, this is a girl who a lot of people fell in love with. We both know, because it says on the back, Countess Sophie Potocka. was a 19-year-old Frederick Chopin. but she was the first. She was a Polish opera singer. -And so they had their love of music together. This is a picture on porcelain. But not just any old porcelain. This is on Viennese porcelain. As far as the date's concerned, it's late 19th century. The quality just shouts at you, it really does. it is a treasure in every sense of the word. until you actually fire the piece. So, it is a tour de force. it's a tour de force from a potting point of view. it really takes some doing. So, £150 back in the '50s. You know, a fair chunk of money today. So, what price a pretty face? ..the estimate would be between £3,000-4,000. she would be delighted to know that everybody still loves her. arguably the most famous and the most important is Wilfred Owen. You've brought something in that actually relates to Owen. Can you just give me a bit of background on it? and through the person that gave him this small book. And then Wilfred Owen himself came down to this area from Birkenhead. How long was he in the area here for and what did he do? Well, he was here for two years. was actually given to Owen. that he was going to when he was living in Birkenhead. He was going to take his first communion. -Yes, that's what I'm trying to say. "Wilfred Owen, from his affectionate old pastor WCF,"
I think it is, "Robson." -And then February 6th, 1910. "Confirmation day. And the Lord bless thee and keep thee." is that he was killed literally one week before Armistice happened. that Owen owned this book. That he touched this book, that he read this book. that we know actually belonged to him or relates directly to him. something like the Imperial War Museum would be interested. I can easily see it making somewhere between £3,000-4,000. -It's just the fact that Owen owned it. -Absolutely. It's a wonderful little thing. Well, it says, Her Majesty's Yacht. -So how did you come to have a cup off Queen Victoria's yacht? and he was an officer on board the Royal yacht. she gave each one something personal of hers. He handed it down to his brother who was my mother's grandfather. And then to my grandmother. And then to my mother. And then to me. for Queen Victoria, in around about 1890-1900. So it's well over 100 years old. -It's been touched by a Queen. Well, it's very nice that it's £150. and maybe then sell it. because you never know what's going to be inside it. It's a feast for the eyes. a wedding present to my grandmother in 1904. Those Victorian families were rather like that. and he gave her this clock as a wedding present. that nobody should outshine the bride. And it's faded over 100 years. the paste would have glistened. It would have looked magnificent. -This is such a typical French clock. which I believe in French is raised field. and then it reveals this wonderful colour. so you might not have noticed but there's even engraving there. -And then it was fire gilded. it would have been a beautiful rich gold colour. is a miniature cartel clock. You can see you've got the bow here. because I know it's also got a strut on the back. -So a lady could have it on her dressing table, as well. -Well, it's a wonderful clock. As you can probably tell, I'm rather in love with it. I would imagine it would come with an estimate of between £700-1,000. That's very interesting. Very interesting. to see here today in Reading. from the early 20th century, Anton van Wouw. Well, this is a family piece. and now we have it in England. for instance, the figure of Kruger which is in Pretoria. Born in 1862 in Holland. He then moved to South Africa in the early part of the 20th century. it was all done from life. And you can see, gosh, he is the accused, standing in the dock. and beautifully observed, as well. I think he's very, very moving. -and not feel his sadness. You know, that is very apparent. We can see the signature there. even though he didn't actually die until 1942.
and this is one of those such pieces. but the market is quite volatile. It is very up and down, I have to say. We would never sell it. It's a family piece that will stay with us. Well, that's nice to know. Yeah. from an antique shop in Brighton in 1973.
cos she liked primitive pictures. Now, let's look at it. And it depicts a scene at the Battle of Waterloo. Tell me what it's about. fighting two French cuirassiers at the Battle of Waterloo. -to about 2.30 in the afternoon. it says, "Thomas Abbott attacked by two..."
"18th of June, 1815, at Waterloo." and here are the two French cuirassiers. He seems to have wounded one but I wonder if he got away? He apparently survived the battle and got the Waterloo medal. -So he's listed as having the Waterloo medal. that you'd have expected this to be painted around that time. But, in fact, this oil on canvas is a Victorian copy. This would have been painted in the 1860s. It has the Highlanders here. Which regiment is that? 42nd of Foot, Black Watch. Black Watch. There they are, with their tartan. and it also has this poor drummer boy right in the corner. And by the drummer boy, a burst cannon. which means painted it in Latin. Well, it's a wonderful picture. has a value. Not as much as you'd like to hope, I suppose. I think, today, it's worth something in the region of £600-800. cos it has too nice a story attached to it. one of the oldest objects we've seen on the Roadshow for a while. And you know quite a lot about it. What can you tell me? Well, it's a late, mid-to-late 17th century stumpwork box. Now, tell us about stumpwork. which sort of died out into the Victorian era. Charles II. And I'm wondering if that's what it depicts. It's anti-Puritan, you know, with butterflies and these little pearls. It's sort of celebrating a return to prosperity to Britain, essentially. Now, where did you come by this, Harry? This isn't something that's just lying around in your bedroom. No, this doesn't belong to me, actually. called Milton Manor in Oxfordshire. -Which is not far from here. And this is, I think, is one of the jewels of the collection. Well, we're so glad you brought it along. -And it's such a rare survivor of its kind. John Foster's going to be looking at it. I've spoken to him already. I know he's hugely excited. A fabulous piece you've brought us in to look at today. tell me how you came by it. My grandfather worked in Colebrooks game department. he saw things like this and he absolutely loved them. They weren't very well off. They lived in Liverpool Road in Reading down by the railway line. and was intending to mend it but never quite did. -I took it to a restorer in Woodley. in my front sitting room. Wonderful. It's, in fact, Japanese. You've just got these fabulous panels, of which there are four. This piece itself is not in fact 18th century. the Meiji period, so 1868-1912.
a koro, or sort of covered urn. Very much a sort of, you know, Japanese shape. It's on silver, so you've got silver here. These wonderful elephant heads are silver. The eagle on top is silver. we've got silver both inside and out there. and actually these are the pieces they're going for. Condition is key and the condition here is very good. it would easily fetch between £3,000-£5,000 at auction. and needlework, stumpwork being the raised panel sections of this box. because his image is on top. Because usually, when we see it, it's faded, torn. How has something survived for so long in this condition? wrapped up in brown paper and a tablecloth. So she brought it down and said, "Ta-dah!" -The tablecloth is an interesting thing. Usually I always think people go a bit over the top with white gloves. With something like this, absolutely. -Because the salt from your fingers will rot this. You know, it should not be touched, basically. -So for a young chap like you, why have you brought this in? All the visitors that come to the house are fascinated by it. You know, you have to push them away, you really do. you notice a different detail. and that's what's fascinating for everybody that looks at it. -with the building of Milton Manor. and then my employer's family got it 250 years ago. -So we think it's stayed with the house its whole life. you're showing where your allegiances lie. this was saying, "I am for the royals." And you have the royals there. I have no idea. Tell me. but why not be the owners of the house? -They're giving themselves status just below the royals. But showing they are below the royals. -Again, it's like a "We're for you." Rebecca, presumably, at the well. And another sort of well-known biblical story of Abraham and Isaac. and was stopped at the last moment by God. but to the royal family of the day. needlework and most stunningly of all, stumpwork. Which is basically like the raised panels, stuffed panels. but to give it this 3D image. -..in such a detailed way. Rabbits, butterflies, I mean, you could go on about this endlessly. Like I say, it's just stunning to see it like this. Obviously, you know what it's for. Yes, it's a lady's toilet box. All lined. And I know you've got the mirror here. I've left it out because it was just a little bit delicate in here. -And then drawered section inside. And then these, all silver mounted. -It's just... It's staggering to see. I mean, this is museum quality at its best. Er... It is a shame it's not yours. -and it spent the night in our sitting room. and I don't think I will in a long, long time. Thank you. Well, that was a great moment, wasn't it? What a reaction. And what a survivor, down through the centuries. that is a real thrill for us and for John. this is what it looks like as our day draws to a close. maybe we'll just stick it back in the cupboard. Let it gather dust then. From the whole team here at Caversham, bye-bye.